Since then, Murray has chaired the Senate Veterans Affairs Committee (2011 to 2013) and has sat on the committee since 1995, during the time Veterans were being placed on “waiting lists,” some dying while waiting for much needed care. While she expresses outrage, where is her accountability in failing to oversee conditions across the country that has led to the deaths of our heroes? Lest we forget, she became a member of the majority when Democrats swept back into power in the 2006 elections and took the White House under Barack Obama in 2008, holding full political power until the 2010 election when Republicans took control of the House of Representatives. But, she remained in the majority in the Senate to this day and her party still holds the White House, winning the 2012 elections. So what happened with all of her expressions above over Walter Reed? What changes did Democrats and she institute when they held full political power and Veterans began dying while waiting for the care they so richly deserved and earned defending our country? “We have come to the point where we need more than good intentions. What we need from you now is decisive action to restore veterans’ confidence in VA, create a culture of transparency and accountability and change these system-wide, years long problems,” she said to VA Secretary Eric Shinseki. Just more empty rhetoric while she grandstands and Veterans continue dying and going without medical care they need? The nation was angered in 2007 over the Walter Reed debacle, much more than we see today as no one is calling for heads to roll like they did then, least of all, Patty Murray. Sen. Murray, we Veterans are not pawns so you can use us to look good and remain in your cushioned seat of authority. You have sat on the Senate Veterans Affairs Committee now for 19 years and apparently, treatment of Veterans has not improved and in fact, has worsened. This is not a Democrat or a Republican matter, it is a disgrace in how America treats her Veterans, the men and women sworn to uphold and defend our constitution and way of life. While she might not be the sole problem, Sen. Murray is a large part of the problem in not provided the proper oversight needed and only expressing outrage when it suits her political career. 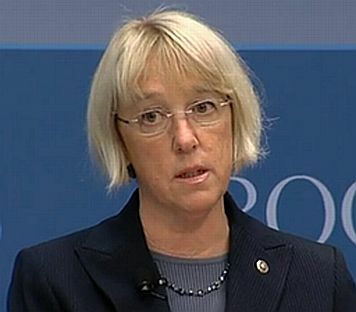 Sen. Patty Murray, you are a disgrace and should, no must resign from the Senate Affairs Committee and the Senate itself. Step aside, please, so we can find people that really will do the job and actually care more about the welfare of Veterans, not just using us as campaign props. You’re right Lew, both Parties, and the Pentagon, ignore veterans as much as they can get away with. It is a disgrace. Murray is, and always has been, the most incompetent person that Washington has ever sent to the other Washington. She is a disgrace. Unfortunately, she lacks the honor to resign. In my opinion, the finest Senator that Washington has ever produced was Democrat Henry Jackson. Too bad we can’t clone people like that. Kinda what you;d expect from her. As I recall Patty won the award for “the country’s dumbest senator” or something like that. She’s just barely smart enough to remember a few standard talking points and punch lines. We have a lot of very bright folks in WA state – yet the majority of voters insist on electing dimwits like Murray and Inslee into office. Both of them are utter embarrassments. I just don’t get it. Senator Dimbulb marched wearing her tennies into office in the wake of the so called Clarence Thomas/Anita Hill scandal. She doesn’t have a single worthwhile original idea in her head and has spent her entire career voting the party line. Thanks to King County. Some voters don’t take the time out to research what the politician has done for them. They’d rather vote on name recognition instead…just to save time. At one time, I thought Patty Murray was an excellent politician…back in the beginning of her political career. It is my opinion that once a politician has made a career out of it by following party lines rather than by voting on their gut instinct brought upon by dedicated investigative work, they should take the high road and respectfully resign. Regarding Patty Murray…that is a decision she would have to make BEFORE the voters make that decision for her. Looks like Kavalkade Krew’s “Komment” shows a blatant dislike for what you wrote, Lew. It must be sad for that blogger to not have any conscience when it comes to the military veterans suffering in silence while they wait for Ms. Murray to decide their fate. Makes you wonder if Kavalkade Krew ever served in the military. They apparently didn’t get the gist of what and why. The House of Representatives has little to do with this, especially with Patty’s 19 years on the Veteran’s Affair Committee supposedly overseeing what happens in the VA or her disgust back in 2007 being so similar to today. And what has changed with them in charge?